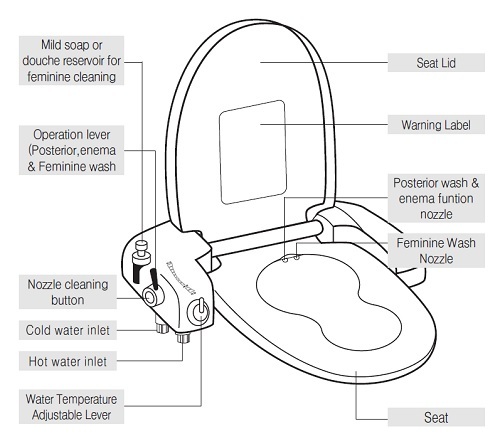 Bio Bidet BB i3000 has been discontinued and no longer in stock. 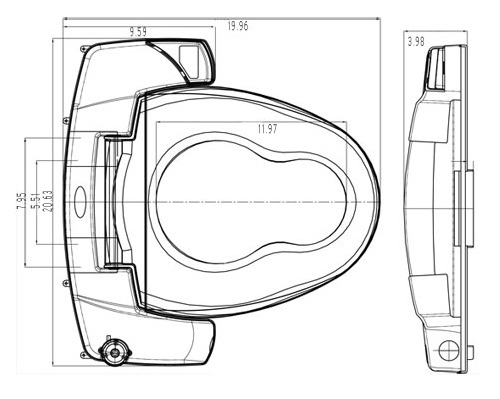 The Bio Bidet BB i3000 is a non-electric bidet seat that takes the place of your existing toilet seat. It comes with both hot and cold water connections so you can still enjoy a temperature-controlled water wash. The cold water line taps into the the supply line found behind your toilet. The hot water line taps into the hot water supply underneath your sink. With both posterior and feminine wash features, the bidet works with two separate dedicated wash nozzles. The BB i3000 is operated with an easy-to-use joystick control, which you access with your right hand as you sit on the seat. It's a pretty intuitive control system - pushing the joystick forward activates the forward (or feminine) wash, while pulling the joystick back activates the back (or rear) wash. The increments in which you pull the joystick forward or backward, correspond to the water pressure produced. So moving the joystick just slightly provides a low pressure wash, while moving the joystick all the way provides a higher pressure wash.
Water temperature is contolled by the temperature dial located next to the joystick control. Also next to the joystick, you'll find a soap button. The built-in soap dispenser can be filled with a mild soap or another cleansing product of your choice. Pressing the soap button will mix a small amount of soap into the feminine water stream. We note the soap function only works in conjunction with the feminine wash. The Bio Bidet BB i3000 is a great solution for those who want a bidet seat, but have issues accessing a nearby electrical outlet. The bidet is powered by water pressure alone, so no electricity or batteries are required. The bidet is excellent quality, easy to set up and use. It SAVES money by reducing amount of toilet paper needed plus it’s much more sanitary. I enthusiastically endorse the product and bidets in general.